Before you read any further, stop and think about a fish migrating up a river. Chances are that fish is a salmon and that river is in BC. 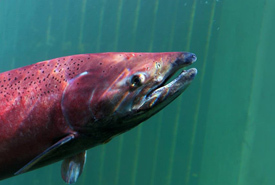 There’s good reason that salmon in BC have come to symbolize fish migration. The return of millions of sockeye, Coho, chum, Chinook and pink salmon to their rivers of birth to spawn and die each fall is one of the most spectacular animal migrations on the planet. The annual return of salmon has a profound impact on the forests and wildlife where these rivers flow. It plays a central role in local economies and Indigenous cultures. But BC’s salmon are just a few of the dozens of fish species in Canada that need to migrate from oceans and lakes, up rivers to spawn, feed and grow. What all these species also have in common is that we have changed their waterscape and fragmented their habitat by dams and other barriers. I grew up surrounded by the Great Lakes, but my understanding of the diversity, magnitude and loss of fish migrations in my home place came late. I thought just salmon ran up rivers in BC. 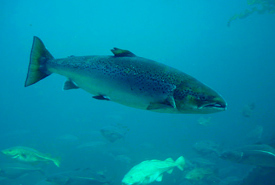 The Lake Ontario population of Atlantic salmon is one of the best examples of a Great Lakes migratory fish and the decline of fish migration. Prior to 1800, the tributaries around Lake Ontario were so full of spawning Atlantic salmon, they could be caught with shovels. Overharvesting had a huge impact on this fish, but the final blow was the boom of dam building to power the mills of the 19th century. With limited access to spawning habitats, the fate of this fish was sealed. The last one was caught in 1898. Just another example showing that overharvesting and habitat loss are a proven formula for extinction. Today, one of the greatest threats to recovering populations of many Great Lakes fishes continues to be habitat connectivity. The construction of dams on Great Lakes tributaries peaked over 150 years ago, when water power was the primary energy source, and started again in the 1940s to manage flooding. 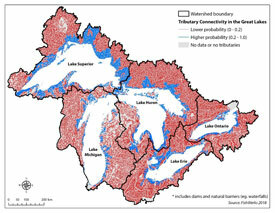 There are currently over 250,000 dams and other barriers in the Great Lakes basin that can potentially inhibit fish migration. Some of these dams are important. They provide water power, flood control and can even help to manage invasive species, such as sea lamprey. But many dams are simply a legacy left over from our early industrial history. 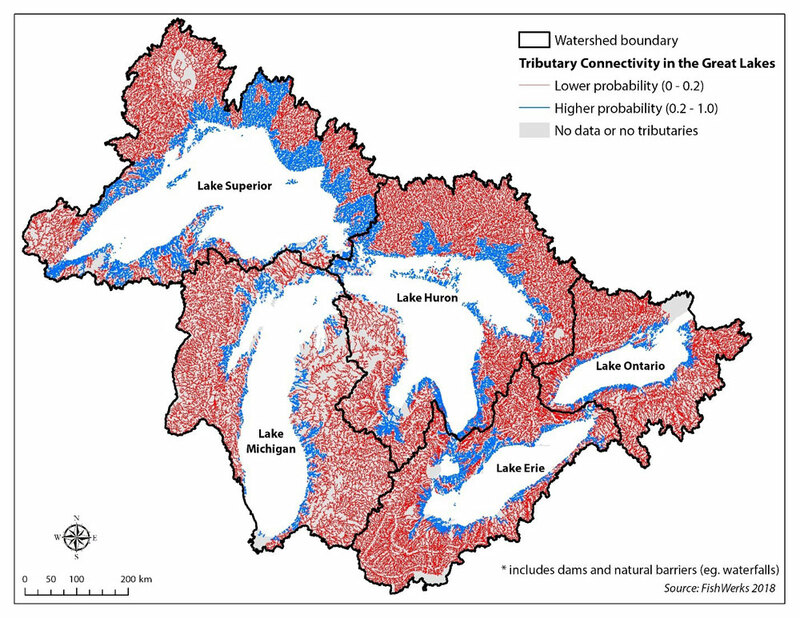 As a result of these barriers, less than 20 per cent of river and stream habitat in the basin is connected to the waters of the Great Lakes (see figure). It’s not just dams that stop fish from migrating. If you drove a car today or took the train, you probably travelled over several streams. Across Canada there are millions of places where roads and rails cross streams. If it’s a big crossing, we build bridges. But to cross smaller rivers and streams, we typically place a culvert (a big pipe made of metal, plastic or concrete) in the stream and build the road over top. Sometimes these culverts have no impact; water and fish continue to move up and down the stream. But often these culverts are installed in such a way that water flows into the culvert, under the road and then drops down into the stream. This can create the lovely sounds of falling water, but for a fish moving upstream, getting up and through that culvert is a big problem. Unless you’re a fish that jumps, or the water levels rise when you need to swim upstream, the river ends here and you’re stuck. Dam. Scientists call these “perched” culverts, and they’re a big problem. An analysis in 2011 by the Nature Conservancy of Canada (NCC) along the coast of eastern Georgian Bay found over 600 road/stream crossings that could potentially impede fishes' passage to spawning habitat. Just one poorly installed culvert in this watershed could be cutting off hundreds of kilometres of spawning and nursery habitat for brook trout, white sucker and dozens of other species. Fortunately, perched culverts can be fixed. They often occur on smaller roads and can be replaced relatively easily and inexpensively. There’s also an important role for volunteers. It’s easy to map and identify where road/stream crossings occur, but people are needed to visit each site and identify if the culvert is perched and if it could be a barrier. There are many examples across the Great Lakes where volunteers are systematically identifying road/stream crossings that are major barriers for fishes. There are also reasons other than fish to fix perched culverts and remove old dams. With more frequent extreme storm events as a result of climate change, many of these culverts simply cannot accommodate these new peak flows. Making sure our culverts are big enough so that roads don’t wash out is critical. Extreme weather is also putting new pressures on our dams. 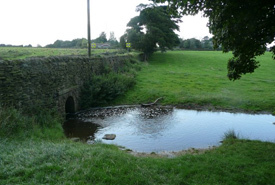 Many of our dams are over a century old, in poor repair and will eventually fail. Removing dams, or installing fish passages when they are repaired, and replacing under-sized, perched culverts is an important climate change adaptation action for infrastructure across Canada. NCC and partner organizations, such as Trout Unlimited Canada and Alberta’s Cows and Fish, have been working on projects across Canada to help restore connectivity in our rivers and streams and help restore populations of migratory fishes. Efforts to bring back the Atlantic salmon in Lake Ontario are showing some success. Groups like the Grand River Conservation Authority have been removing dams that are no longer needed. Canada and the U.S. now track the connectivity of rivers and streams as an indicator of the health of the Great Lakes. There is also increasing focus on protecting freshwater ecosystems. Over the past 10 years, NCC, with the support of private landowners, businesses, local governments and funding from the Government of Canada through the Natural Areas Conservation Program, has secured habitat for over 60 native species of freshwater fish, including migratory fishes that are at risk, such as American eel, copper redhorse, striped bass, sockeye salmon and lake sturgeon. Our restoration projects now include improving connectivity for the endangered redside dace in Ontario. In Atlantic Canada, we are developing an aquatic blueprint to help support the protection our rivers and streams. Across the country, Canadians are also volunteering to help restore rivers and streams. We need to accelerate this work. Migratory fishes play a critical role in the health of our many ecosystems, and they support local economies. But perhaps the most important action we can all take is this: to increase awareness that fish migration occurs almost everywhere in Canada, including the rivers and streams where you live. Please, celebrate the salmon of BC, but also discover the fish migrations that share your waterscape. Migrations that still occur, migrations we have lost, and migrations we can still restore. We are living in a world where nature is becoming increasingly fragmented. We need wildlife corridors for bears, lynx and moose, and we also need them for bull trout in Alberta, longnose sucker in Manitoba and striped bass in Quebec. Just as we need to connect forests, wetlands and grasslands, we also need to ensure our rivers are connected. 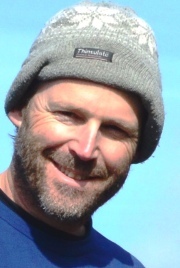 Dan Kraus is NCC's National conservation biologist. Read more about Dan Kraus.